Conrad Smith of the All Blacks poses for a portrait in Chicago. 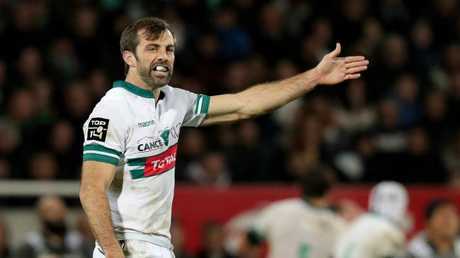 ALL Blacks legend Conrad Smith has confirmed he will hang up his boots at the end of the season after three seasons with Top 14 club Pau. Smith was enticed to France at the end of 2015, calling time on an international career that brought him two World Cups and 94 caps for New Zealand. The 36-year-old, a qualified lawyer, said he was ready to end his playing career and concentrate on player advocacy. Smith, whose rugby smarts extended his international career in the centres despite pressure from younger contenders, also revealed he was considering coaching. "I'm going to finish up this year and I think I will spend a year or two either doing a little bit of work with International Rugby Players (Association), but also within rugby itself and the coaching set-up and see what I like," he told Irish website The42. Conrad Smith hopes to finish on a high note with French team Pau. But first, Smith hopes to finish his career with some club glory. "I'm completely focused on our adventure in the league and European Challenge Cup," he said. "The excitement of being in the race for the playoffs and playing a Challenge Cup quarterfinal is enough to keep me interested. "However, I won't hide that I'm hoping to stay in the Bearn - that's my goal!"